Organizers set up a whiteboard where show visitors could write messages. Armando left our mark. Macworld|iWorld (née Macworld Expo) may be an Apple-centric event, but there was something for almost every gadget geek at this year's show in San Francisco. This year's event marked the third year that Apple was a no-show, but the exhibit hall was packed as usual with hundreds of booths and thousands of visitors. Come along as we look at some of the highlights--and absurdities--from this year's show. What could you do with $68,000? You could do all the normal stuff like pay your bills and buy groceries over the course of a year, or you could buy this speaker set from Taiwan-based All Jack. Its design is modeled after the shape of a wine bottle, according to the placard describing it, and the outer shell is made of wood. 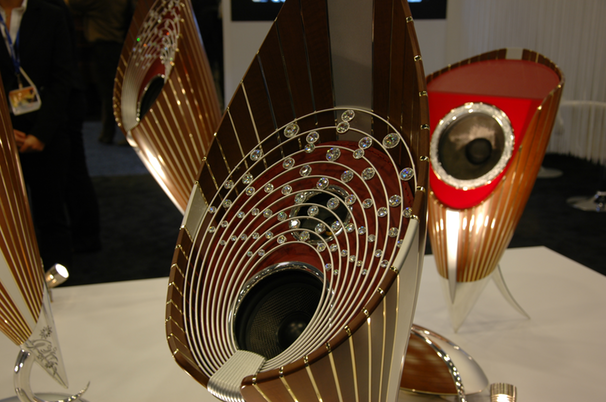 Surrounding the speakers themselves is a red leather lining and...Russian Diamonds. The eXpress keyboard tray from BulletTrain lets you use your wireless Apple keyboard and mouse in a laptop-like arrangement, and it's designed to make it easier to use your desktop Mac without having to be seated at your desk. I can see where this might be useful if, say, you have a TV tuner hooked up to your Mac, or if you use your Mac to watch DVDs, and you want to sit back on your sofa. The eXpress tray is available for pre-order now, and starts at $79. It should ship in March. We're fans Mimoco's Mimobot novelty flash drives--they make file storage fun! The company announced a new drive at Macworld|iWorld that features a caricature of Albert Einstein. This new drive comes in sizes ranging from 2GB to 64GB, and prices start at $23. The iPad's onscreen keyboard isn't for everyone; it's especially problematic touch-typists. The iKeyboard attempts to make things a little easier. It's an overlay that attaches to your iPad using strips of plastic adhesive; it detaches easily and doesn't leave any adhesive residue behind. 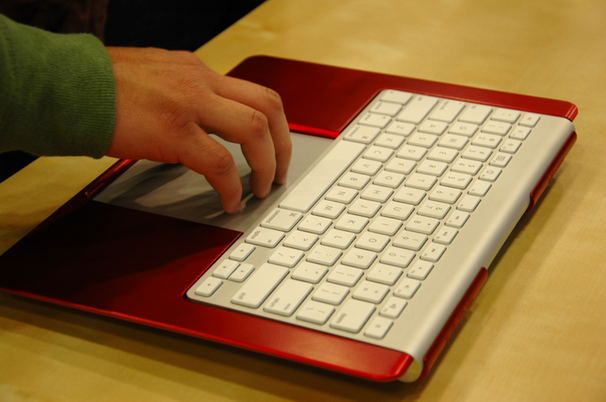 According to its makers, the iKeyboard is designed to mimic the feel of the standard Mac keyboard in terms of how much force it takes to press the keys. In my brief hands-on time with it, I found it a little awkward to type with. The iKeyboard booth representatives say that it does take some getting used to, though, so I'll reserve judgement for now. The iKeyboard isn't out just yet, but when it ships, it'll run around $35. Learn more at the iKeyboard site. The NomadBrush isn't a brand new product--our friends at Macworld included it in a roundup of iPad styluses last May--but this is the first time I've gotten a close-up look at one: It's a stylus for the iPad and other capacitive-touchscreen tablets that tries to make drawing or "painting" on a tablet feel more natural. The NomadBrush even has bristles on one end to make it look and feel like an actual, traditional paintbrush. The stylus comes in several varieties; we got a demo of the Nomad Compose and the kid-friendly Nomad Play at the show. The compose costs $39; the Play runs for $18. Check out the NomadBrush site to learn more. Accident-prone? iBallz might be perfect for you. This accessory provides your tablet with some degree of shock-absorption in case you drop--or otherwise get careless with--your expensive gadget. iBallz comes with four foam-rubber balls attached to an elastic cable that slide over the corners of your tablet. The company says it's targeting schools with the iBallz, but it might be ideal for anyone who's a little careless with their gear. iBallz costs $20, and comes in versions for the iPad 1 and 2, as well as some Android tablets. PCWorld Editorial Assistant Armando Rodriguez contributed to this story. Nick Mediati covers security for PCWorld and oversees the GeekTech blog.